Disclaimer: I am a Glee fanatic. I have not had the opportunity to watch any episodes from the new season this year, however in the previous seasons I was hooked. I especially loved the creativity in the “mash-ups” of different songs and marveled at how fluid it all seemed, even when the songs had virtually nothing similar between them. When I think about Chanukah “mashing” together with Thanksgiving this year (a phenomenon that we won’t be around to experience again as it won’t happen for over 70,000 years, so they say), I am astounded at the timeliness of this occurrence particularly for our family. Chanukah is a holiday of miracles, a holiday of faith and a holiday of perseverance. It’s a holiday that reminds us that even during the darkest days of the year, there is light, and we are not alone. We were supposed to be celebrating this once-in-a-lifetime event in Seattle, with Scott’s family. 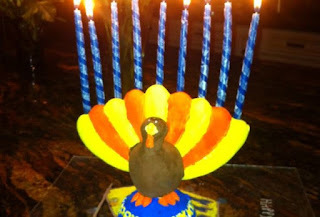 We were looking forward to having a wonderful turkey dinner with a side of latkes, of being around family and offering up our thanks while watching the dreidels spin. 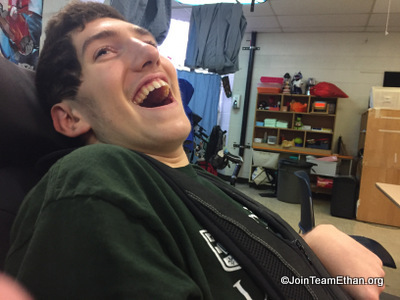 While our location has shifted, we see that we have our own miracle in Ethan, and we think about how different and empty our lives would have been had he not shown his own faith and perseverance on June 29. We are reminded daily of how many beautiful people have surrounded our family in love and have uplifted us through words and actions. To the countless people and communities who have kept our family in their prayers we send you wishes for a beautiful holiday season. For those who celebrate Chanukah, may the lights of your menorah illuminate your path and may you never feel alone. For those celebrating Thanksgiving tomorrow, may you find ways to be thankful for all of the large and small blessings in your lives.